Welcome to join us during the Installation of our newly elected Exco (2010-2011) and monthly Chapter meeting on (Wed) 21st Jul 2010. Mark your calender now. It will be a night of networking, boosting your confidence when you learn and unlearn. As dawn rises, a beautiful butterfly could hear bustling noises from the street and chipping of the birds from the trees. It was happily fluttering its wings around the garden. Before the butterfly can enjoy its freedom, it needs to go through a metamorphosis. During its life cycle, a butterfly undergoes several changes in body form and appearance. 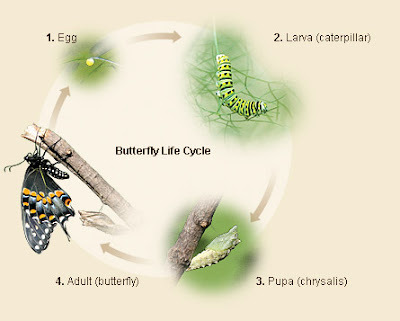 The four stages of this metamorphosis are: egg, caterpillar, pupa, and butterfly. In the 3rd stage, the caterpillar needs to spin itself into a soft and silky cocoon to protect its pupa. Pupation may last weeks, months or even years. Make a guess what will it do before it transforms? Before I provide you with the answer, let me share my story with you. I was an introvert since young. During my childhood days, I have developed a mindset that is; “Talk less, listen more”. Being an introvert, I listen more than I speak. I was timid and scared to speak up. There were times because of my character, I was misunderstood and for the worse, I was blamed for things that I never done. I realised that it is time for me to be heard. An opportunity came along. 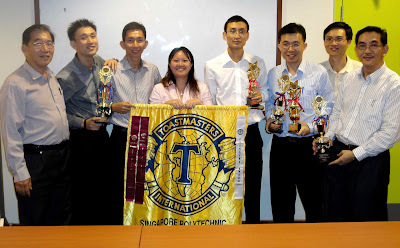 I saw Singapore Polytechnic’s eFlyer introducing Toastmasters. Out of curiosity, I attended one of the introductory workshops. The proficient speakers were not only speaking effectively but also inspiring people around them. The charisma within them got me interested to find out more. Deep in my heart, I knew that this is the skill I want to learn. There is an old saying; “The FIRST step is always the toughest.” I stumbled when I made my first maiden speech in the basic manual project. My hands were shaking and my voice was cracking. I heard voices, felt my fears and was perspiring as I spoke. The inner struggle within me was a big challenge for me. However, each time I fall, I pick myself up and try again. I kept telling myself that as long as I do not give up, I am sure even the most incompetent speaker like me will be able to master the speaking skills one day. The word “Failure” never crossed my mind. I just knew that I have not mastered the skill yet. Whenever I make mistakes, I will change as I learned; it gave me motivation and confidence to speak up more. After a few years in Toastmasters, I have slowly walked out of my own cocoon, built my self-confidence and spoke with conviction. Toastmasters has made me understood the importance of people connections besides learning how to speak and listen effectively. By taking up different EXCO roles, it allows me to learn leadership and interpersonal skills as well. I was required to interact with a lot of people, getting contacts from them, arrange meetings etc to ensure the meetings were carried out smoothly each time. All these tasks are the learning blocks for me to understand and develop my skills. I kept in mind that struggling is an essential part of my growth experience. In fact, it is the struggle that causes me to develop my ability to communicate better. I strived to apply what I learnt in Toastmasters in each day of my life. I have changed my negative thoughts into positive ones by changing “Why me?” into “How to do it” mindset. It makes me happier as a person. I am not only able to communicate and connect with my family and friends better these days but also I have widened my circle of friends now. Here is the answer to my earlier question. Before the caterpillar could transform into a butterfly, it is supposed to BREAKTHROUGH. The pupa’s breakthrough helps the butterfly to push its way through the tiny opening of the cocoon which in turn pushes the fluid out of its body and into its wings. Without the struggle, the butterfly would never be able to break free from the cocoon it has created and fly into freedom. Welcome to join us during the monthly Chapter meeting on (Wed) 16th Jun 2010. Mark your calender now. It will be a night of networking, boosting your confidence when you learn and unlearn. Come and join our monthly Chapter meeting. Mark your calender on 17th Mar 2010. It will be a night of fun, laughter and building confidence when you learn and unlearn. 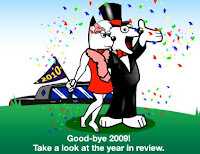 You must join us during our 2010 Contest. Please mark your calender, it's going to be on 10Mar2010 (Wed). See our contestants delivering their speeches. If you are coming for the first time, please email us at sp@toastmasters.sg, more info will be send to you before your arrival. Thanks.